I enjoy reading poetry although I do not always understand or appreciate what I am reading. Even though I enjoy reading poetry I would never pick up a poetry book and read it like I read a novel. Instead, I skim through a poetry book until I find one that attracts my attention and then I read that. Ballads are great because they tell a story and their structure makes it easy to follow the poet’s meaning while free verse is harder to read and to make sense of. I admire a poet’s ability to use words well and to draw pictures in my mind using a minimum of works. They have a great grasp of vocabulary and understand how to use a variety of language devices to strong effect. It is not easy to write an effective poem that has meaning and a cohesive structure. I know when I try and write poetry I can get caught up in a need to rhyme and then start choosing words because they rhyme and not because they are the best word to use. 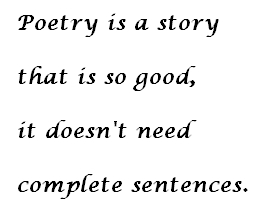 That is often the problem for many students who write poetry. My favourite poems are Shakespearean sonnets, ballads such as the ‘Geebung Polo Club’ and ‘The Man from Ironbark’ and poems about nature. I also enjoy any humorous poetry. Ogden Nash, for example is always quite clever and witty. The founts of poison in its being set. Till mind and sense recoil in nameless dread. And on an innocent world it’s presence thrust? By this insidious dragon of the dust. O slender vial filled with poisoned wine! Fill all my being now with life intense? A coloured worm that wriggled in the mould? and fell by its side in the grass. I saw him turn in the reeds. I felt the clutch of earth. O beat him into the ground. drains through those colourless eyes. turns outward clear and dead. as water is, or wind. and drink at his shallow eye. poised and ready to strike. yet inside I became cold. Well read poetry can be powerful. Listen to the brief biography of a man called Frederick Douglas followed by the words of a poem about him written by Robert Hayden. Then listen to a reading of the poem which I find quite moving and powerful. I want this to illustrate the idea that poetry is to be heard and listened to as much as, if not more than, being read. 1. When you hear this read what does it sound like? Does it sound like a poem? What form of rhythm is employed? 2. The poet uses the techniques of repetition and reiteration. How does the poet do this and what is the effect? Find a poem about nature – preferably an Australian poem – and prepare a reading of the poem to present to the whole class. In this activity a group of people take on the role that one person would when reading a poem out loud. They share the load, sometimes speaking together, sometimes singly and sometimes in smaller groups but always seeking to get the poets ideas across. The first video gives some tips on reciting poetry then the next two are examples of group verse speaking.